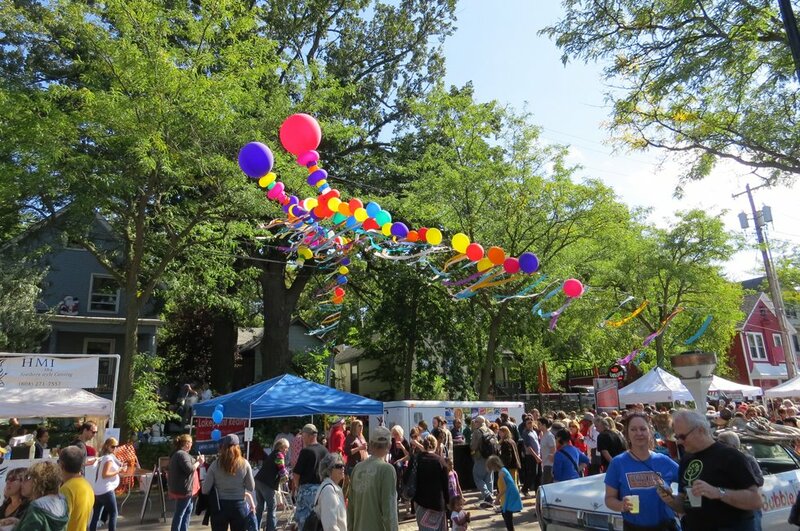 The Willy Street Fair is this weekend, September 19-20 2015. It has been a fantastic summer for neighborhood celebrations in Willyland. 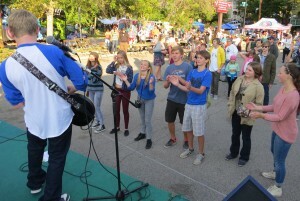 Waterfront, La Fête de Marquette, Orton were solid as ever along with some sophomores like Yum Yum Fest and Central Park Sessions. Creating addition buzz was Africa Fest and the opening of the new Goodman Skate Park in Central Park. Our new park on Wilson street is really coming into it’s own, but it’s appropriate to bring the fun back to Willy Street for one last weekend of summer fun, music, food and celebration of our great neighborhood. We have had some challenges this year too. The death of Tony Robinson only a half-block from where this year’s fair will take place has highlighted the work both police our city have to do to be more inclusive to our minority communities. Yes even the open arms of the Marquette neighborhood still has some things to learn. Our funky neighborhood is also dealing with other crime such as the terrible sexual assault last weekend on the Capitol City Trail bike path and questions of how development should proceed along this street that still has many residential buildings. The Kid’s Stage is always popular with…well the kids. 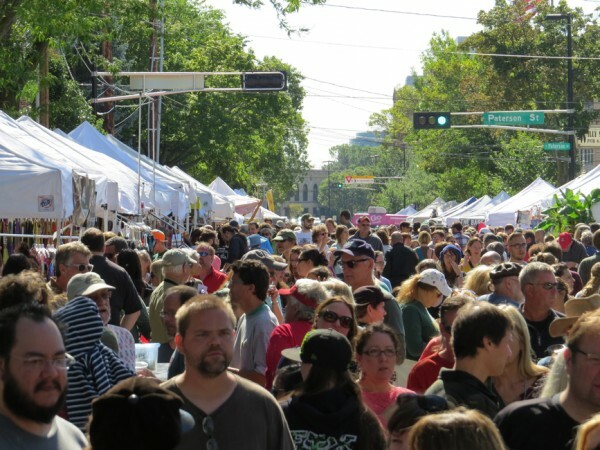 The Willy Street Fair, started 38 years ago as part of a rallying of the neighborhood to feel better about itself and to have better control of it’s destiny. The organizing aspect is still there in many ways as the truly entertainment aspects of the event still raise money for Common Wealth Development and Wil-Mar Neighborhood Center. Growing up in the 1980s I would often be teased by crosstown kids because I lived in the Marquette neighborhood. Now this is THE place to live and play, which is great; but housing is still an issue as even my family, which makes a solid combined income, will likely not be able to remain here if we want to purchase a home. For those less fortunate, affordable housing, services and more are even further out of reach. Throughout this entire time, Common Wealth and Wil-Mar have provided vital services so all types of people can enjoy our neighborhood, which is especially important since we are located so close to downtown and transitory populations. 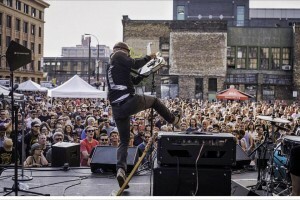 The city’s largest block party begins Saturday with the Willy Warm-up from 2 to 9 p.m. with three music Stages. World Music is featured on the Main Stage (Plan B lot) with Moroccan, Israeli and Cuban music by Pellejo Seco as a possible welcome to our new diplomatic status with our southern neighbor. 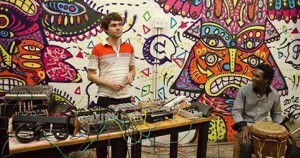 The festival within the festival belongs to the Electronic Music Stage with five acts including Foshizzle Family and the Midwest debut of Colombian jungle techno due Mitú. Ben Silver will play both an afternoon set on the street and at an afterparty at Plan B. 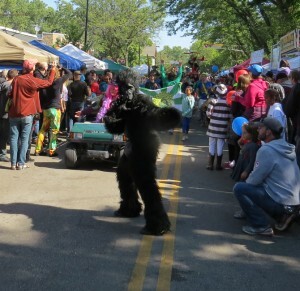 The official part of the Willy Street Fair is Sunday with the grand Willy Street Fair Parade that begins at 11 a.m. in front of Plan B. The event is free-form which means just about every traditional parade element is turned on it’s ear and modified for the tastes of the Willy Street community. It is also open to all who want to participate; pick a theme and march like you won the lottery! Music begins on most Stages at 12 or 1 p.m. with the Kids, Culture, and Underground Stages joining the Folk and Main Stage. Moon Gypsies, Cris Plata & Extra Hot, Mamma Digdown’s Brass Band and The Mustache will grace the Main Stage until 7 p.m.
John Jacobs, John Petty and Dana Perry begin the Folk offerings followed by Madpolecates, Blake Thomas and Samuel Llanas. The Culture Stage features familiar acts in Yid Vicious and Sadira along with Charanga Agoza and Zhong Yi Kung Fu Lion Dance. The Undeground Stage has seven acts led by Meghan Rose & The Bones, followed later by Fringe Character and finishes with Minneapolis’ The Blind Shake. The Willy Street Fair is always fanciful, exhilarating and intense. One of the best kept secrets of the music offerings is the Kid’s Stage. Black Star Drumline leads off the mini-festival followed by the Twirlettes, Truly Remarkable Loon, Eastsde Youth Performers featuring the Marquette Elementary Show Choir, Madison Unicyclists, Drum Power and Disq. Over 150 vendors have signed up this year which means there will be plenty of food, drink, wares as well as a few causes you might want to know more about. The Willy Streeet Raffle holds it’s drawing at 6:30 p.m. following the last Kid’s Stage performance but you don’ have to be present to win. Also, just in time for harvest, the Great Pumpkin Weigh-off Stage in the 800 block of Williamson will be taking entrants from 11 to 5 p.m Sunday. So come to the fair and buy some food, a drink and enter the raffle to support our neighborhood organizations who haven’t stopped caring no matter how popular our neighborhood has been over the years. 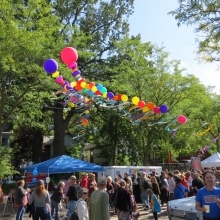 The Willy Street Fair balloon arch painted by the waning summer sun at the Willy Street Fair, September 14, 2014. 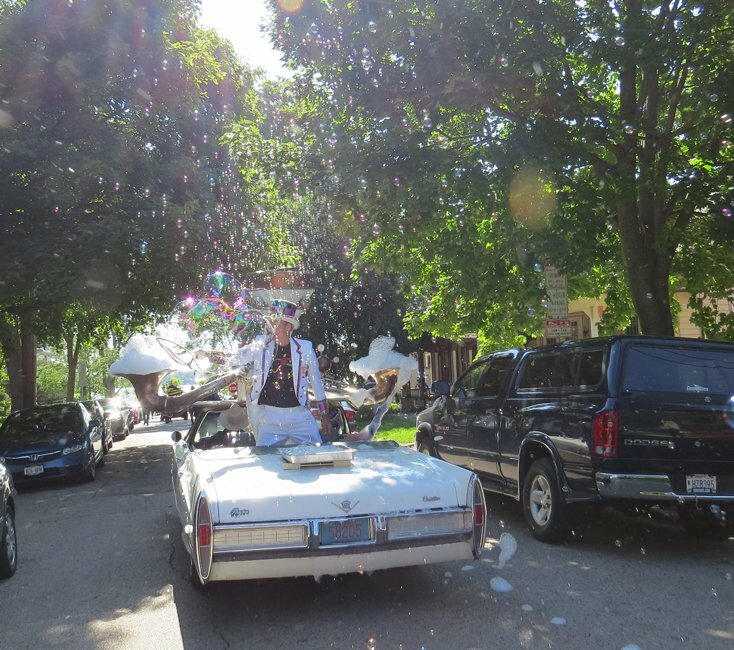 The Bubble Mobile creates a late summer snow storm of bubbles during the Willy Street Fair Parade, September 14, 2014. This entry was posted in Uncategorized and tagged Ben Silver, Black Star Drumline, Blake Thomas, Charanga Agoza, Commonwealth Development, Cris Plata & Extra Hot, Disq, Drum Power, Foshizzle Family, Fringe Character, John Jacobs, John Petty and Dana Perry Madpolecates, Madison Unicyclists, Mamma Digdown's Brass Band, Marquette neighborhood, Meghan Rose & The Bones, Mitú, Moon Gypsies, Plan B, Sadira, Samuel Llanas, The Blind Shake, the Mustache, Truly Remarkable Loon, Twirlettes, Wil-Mar Center, Willy Street Fair, Yid Vicious, Zhong Yi Kung Fu Lion Dance by TheEastSider. Bookmark the permalink.